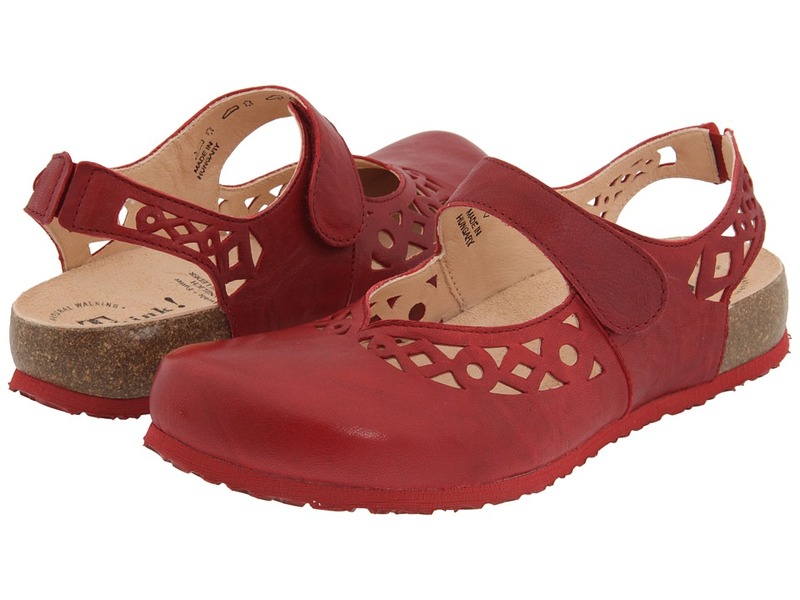 Spend the entire day roaming the farmer~s market in style and comfort with the Julia - 86341 clog from Think!&amp#174. 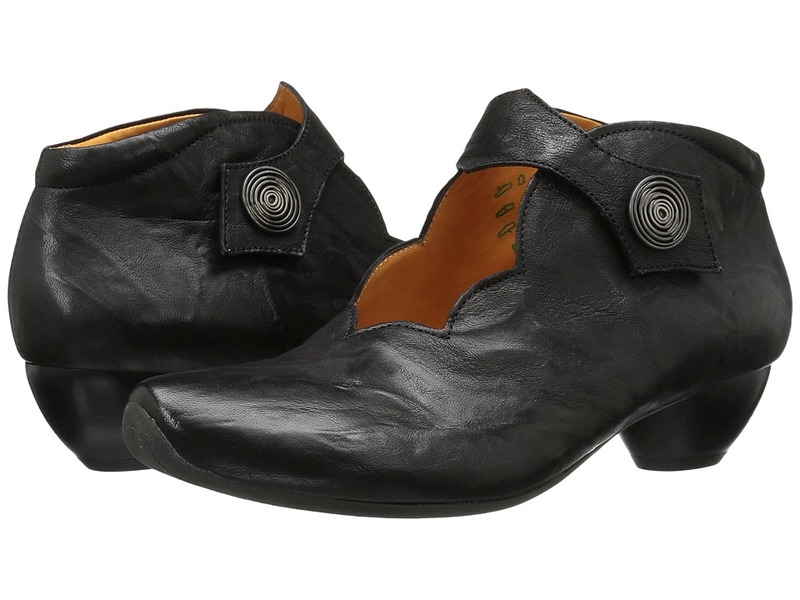 Rich leather upper with beautiful cutout detailing for added personal flair and stylish appeal. Hook-and-loop mary jane strap and hidden goring on the back strap offer a secure and custom fit. Leather sock lining and suede-covered footbed wick away moisture so feet stay healthy and dry. Anatomical cork footbed with built-in ball, heel, and arch support ensures comfort and increases stability. Artistically-designed rubber outsole provides flexible durability that is sure to last many seasons. Measurements: Heel Height: 1 in Weight: 9 oz Platform Height: 1 2 in Product measurements were taken using size 39 (US Women~s 8-8.5), width B - Medium. Please note that measurements may vary by size. Weight of footwear is based on a single item, not a pair. 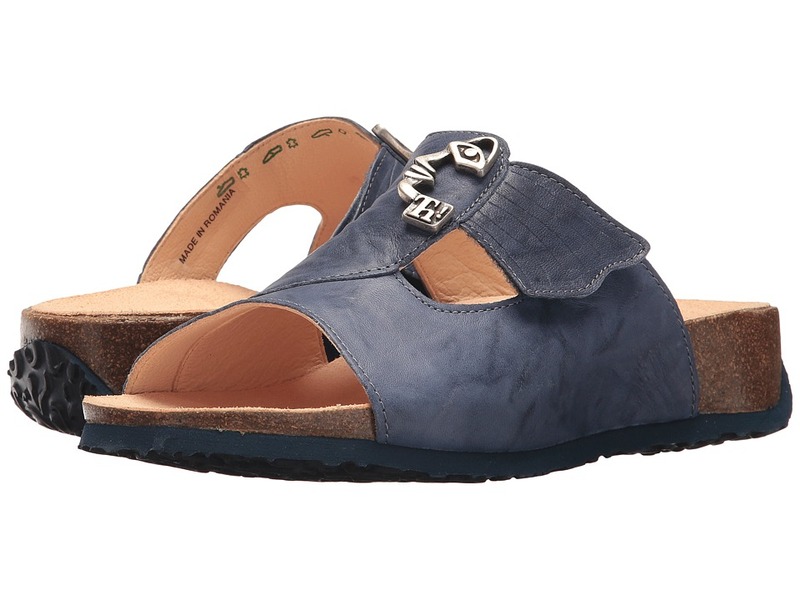 The Julia Damen - 82334 is a marvelous sandal to show your love for independence! 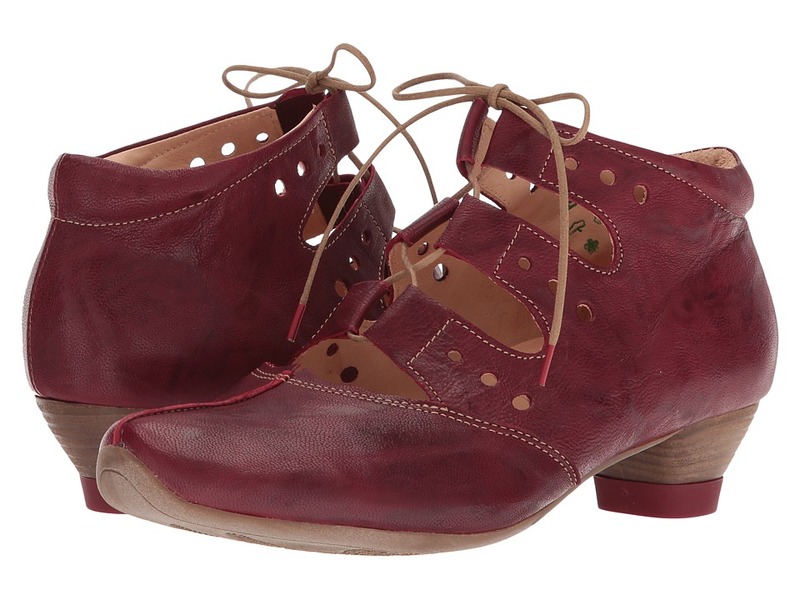 Leather upper with contrast stitching and star patterns. Easy slip-on styling. Leather sock lining molds to the shape of the foot and is breathable for a healthy foot environment. Leather-lined, anatomical cork footbed absorbs shock for reduced foot and leg fatigue. Built-in ball, heel, and arch support ensures all-day comfort and increases stability. Durable rubber outsole provides flexibility and traction on a variety of surfaces. Imported. Measurements: Heel Height: 1 3 4 in Weight: 8 oz Platform Height: 1 2 in Product measurements were taken using size 40 (US Women~s 9), width B - Medium. Please note that measurements may vary by size. Weight of footwear is based on a single item, not a pair. You don~t have to think twice about your style choices when you slip on the Think! Aida mary jane pump. Rich leather upper. Hook-and-loop closure for a secure, ready for all-day wear. Leather sock lining wicks away moisture for a healthy foot environment. Synthetic sole for a good in-shoe feel. Faux stacked heel for added design. Durable polyurethane outsole provides long-lasting durability. Imported. Measurements: Heel Height: 1 1 2 in Weight: 12 oz Platform Height: 1 4 in Product measurements were taken using size 40 (US Women~s 9), width B - Medium. Please note that measurements may vary by size. Weight of footwear is based on a single item, not a pair. You don~t have to think twice about your style choices. 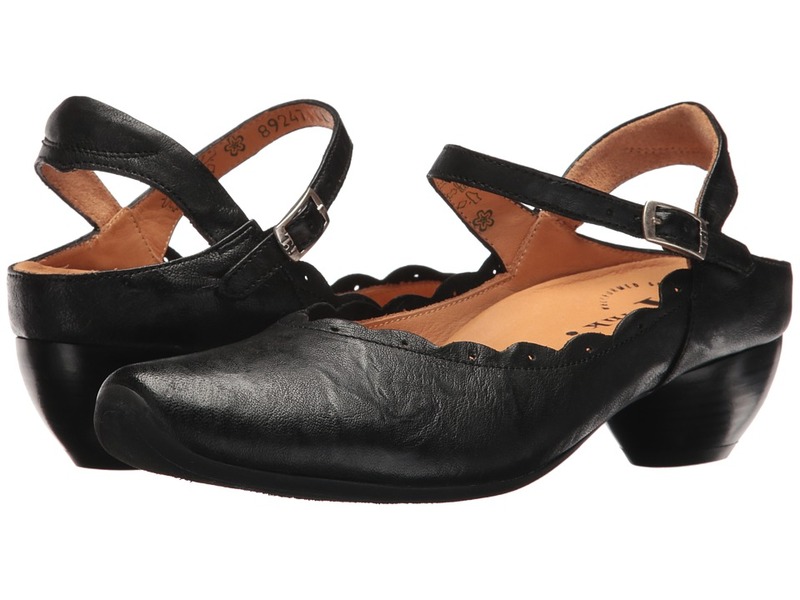 Smooth vegetable tanned leather upper features scalloped topline and soft heel strap. Buckle closure around ankle for adjustable fit. Vegetable tanned leather lining for naturally breathable interior. Low heel. Durable thermoplastic polyurethane outsole provides long-lasting durability. Imported. Measurements: Heel Height: 2 in Weight: 10 oz Product measurements were taken using size 40 (US Women~s 9), width B - Medium. Please note that measurements may vary by size. Weight of footwear is based on a single item, not a pair. Think! before you complete your outfit in your favorite heels. Rich leather upper features laser-cut detailing. Ghillie lacing for easy tie-up wear. Textile lining and leather insole. Faux stacked heel for added design. Man-made outsole provides long-lasting durability. Made in Germany. Measurements: Heel Height: 1 1 2 in Weight: 11 oz Product measurements were taken using size 40 (US Women~s 9), width B - Medium. Please note that measurements may vary by size. Weight of footwear is based on a single item, not a pair. Your signature look will shine brightly this season with the 82326 sandal by Think!! Upper is constructed of metallic leather. Easy slip-on design with open-toe styling. Elegant gold and silver metallic contrasted straps. Adjustable hook-and-loop closure secures foot in place. Supple suede lining keeps feet cool and comfortable. Cork footbed contours to foot for a personalized fit. Lightweight EVA outsole provides excellent flexibility. Imported. Measurements: Weight: 7 oz Product measurements were taken using size 40 (US Women~s 9), width B - Medium. Please note that measurements may vary by size. Weight of footwear is based on a single item, not a pair. Strut with confidence knowing all eyes are on you in the Think! 82335 sandal! Upper is constructed of premium leather. Elegant reptile print decorates the straps. Easy slip-on styling with strappy-thong design. Supple suede lining provides a breathable wear. Cork footbed contours to foot over time for personalized comfort and arch-support. Durable rubber outsole is adorned with special treaded pattern increasing traction and grip. Imported. Measurements: Weight: 8 oz Product measurements were taken using size 39 (US Women~s 8), width B - Medium. Please note that measurements may vary by size. Weight of footwear is based on a single item, not a pair. The Think! 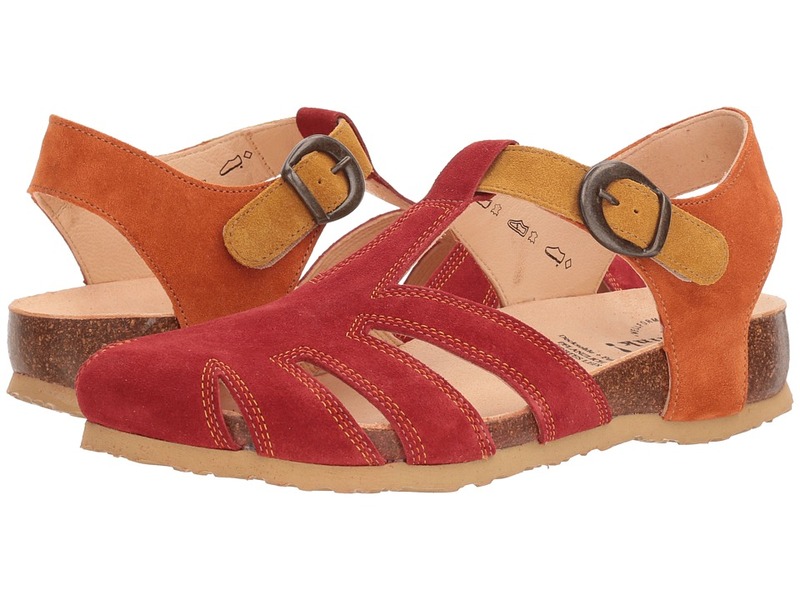 82343 is beautifully comfortable for all-day wear. 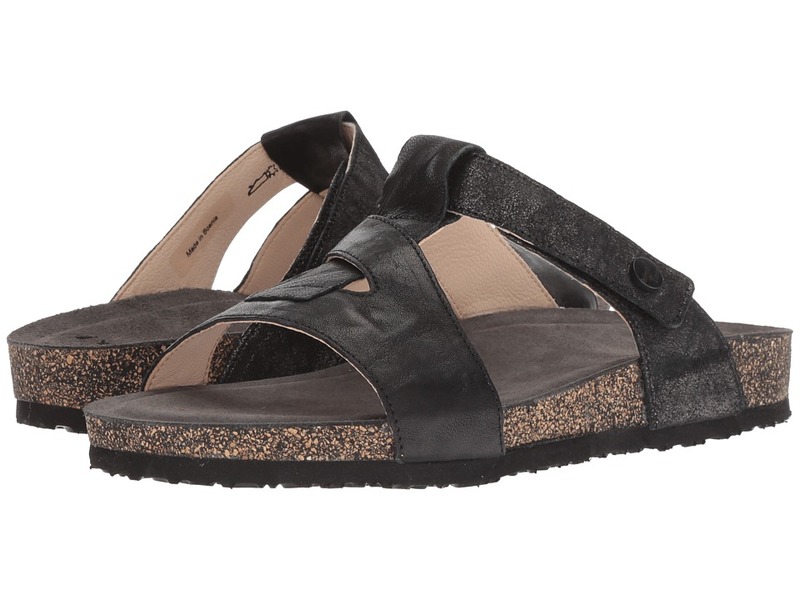 Fisherman sandals in a leather upper. Buckle closure at ankle for adjustable fit. Molded footbed cradles the foot for all-day wear. Leather lining for breathable wear. Cork and latex midsole. Durable synthetic outsole. Imported. Measurements: Weight: 10 oz Product measurements were taken using size 40 (US Women~s 9), width B - Medium. Please note that measurements may vary by size. Weight of footwear is based on a single item, not a pair.